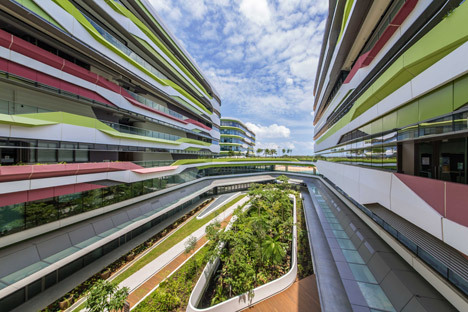 Dutch architecture workplace UNStudio has completed the initial two buildings of a major new university campus in Singapore, designed as a seamless network of rooms, balconies and courtyards . 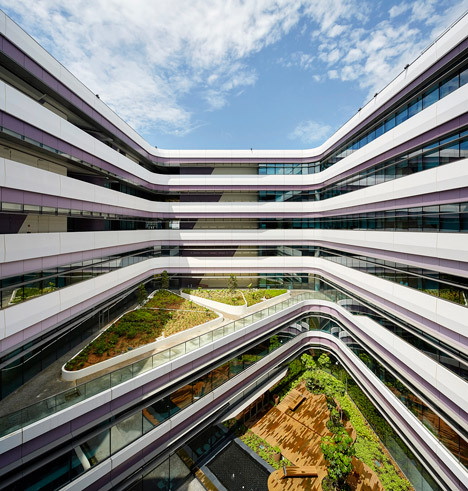 Functioning in partnership with regional company DP Architects, Amsterdam-based UNStudio developed five interconnected structures for the campus of Singapore University of Technological innovation and Design – an institution that was only established six many years in the past. The two firms have now finished the 1st phase of construction. 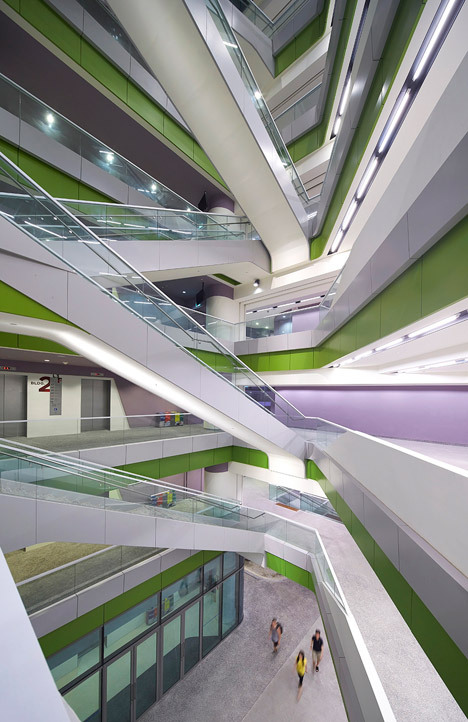 This contains the 7-storey-large blocks 1 and two, as properly as elements of blocks three and five – accounting for 106,000 square metres of floor room. The design is centred close to the thought of “non-linear” structures. 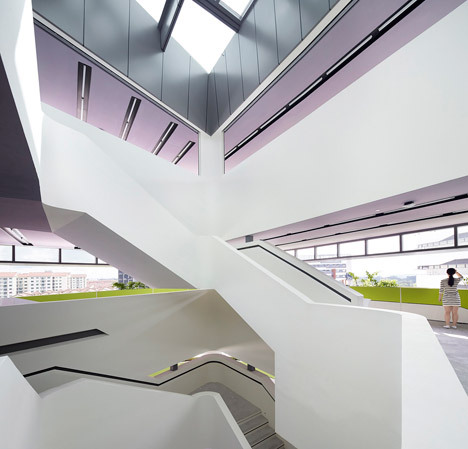 Rather than dividing the campus into different faculties, the architects want to motivate interaction among various departments, as well as among employees and college students. 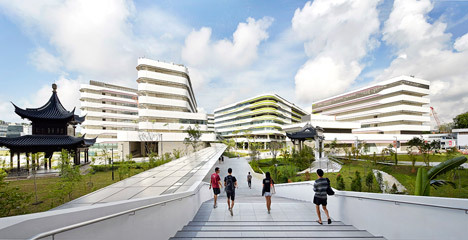 “To foster innovation, the campus demands to allow for flexible solutions to ever-modifying wants, which is why meeting spaces, classrooms and laboratories can adapt to diverse arrangements, addressing the evolving specifications of the university as the versatile curriculum develops,” Tan explained. The campus is organised around a north-to-south and an east-to-west axis. 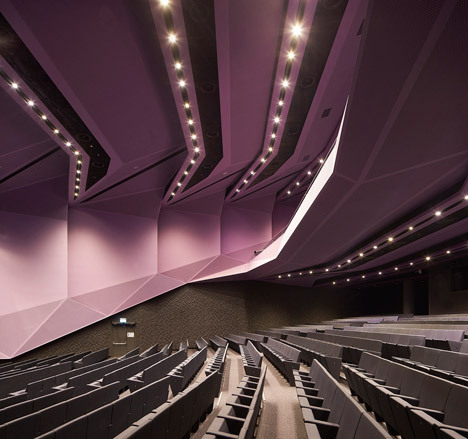 These intersect at a stage known as the campus centre, which forms a versatile multi-purpose room that can be employed to host exhibitions and other occasions. 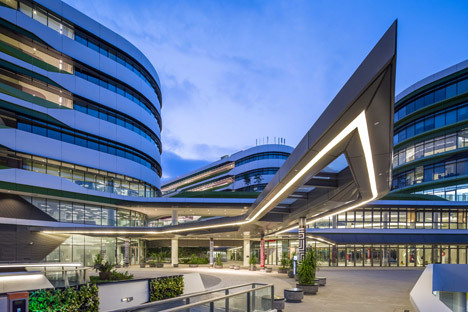 From here, corridors lead via to the main auditorium, the main library and the International Style Centre – a hub for technology-driven analysis. Classrooms, laboratories and meeting rooms are spread out across the campus. 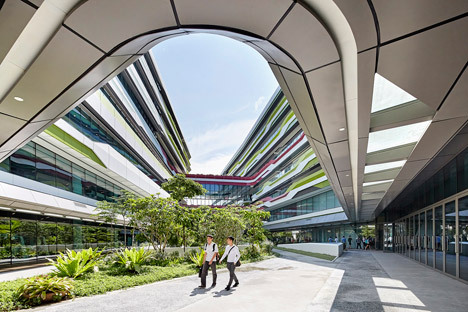 “The design for the SUTD consciously avoids over-articulation and rather focuses on infrastructural qualities, on connectivity and the creation of an open, transparent and light facility that responds to the requirements of the contemporary campus,” mentioned UNStudio founder Ben van Berkel. 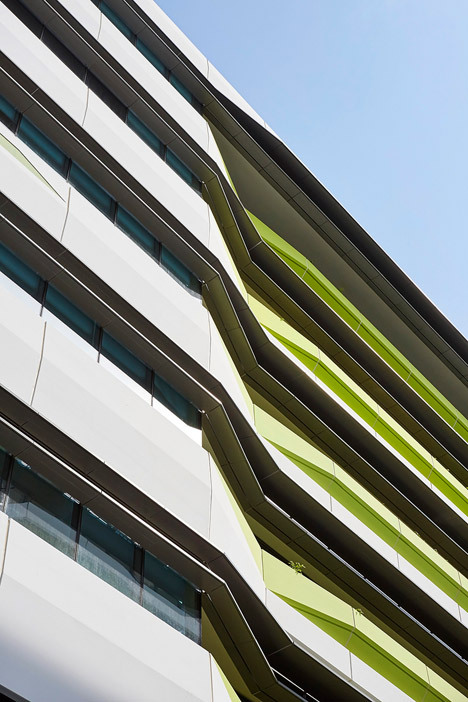 Externally, a pre-cast concrete facade technique provides the developing a bright white surface. This is interspersed with flashes of green, red and purple, assisting users to navigate the campus. 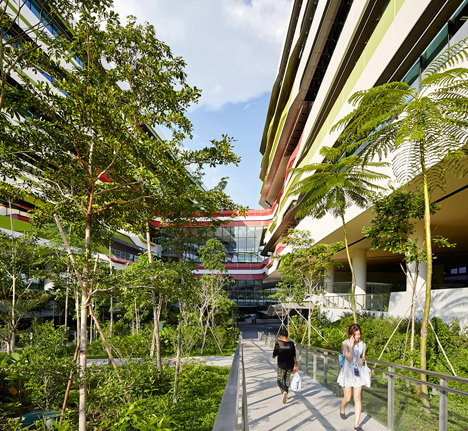 “From the exterior the SUTD academic buildings seem like somewhat dense, separate blocks, but they are in truth knowledgeable in a fully connected and open way,” explained van Berkel. 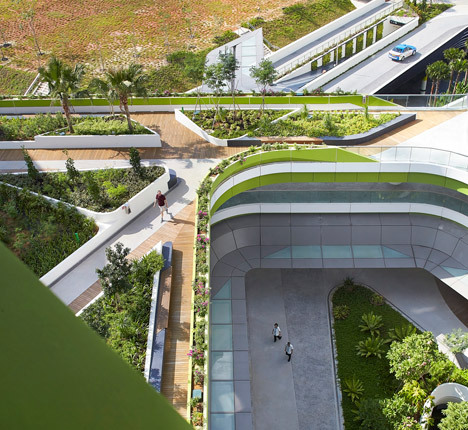 The two completed buildings and individuals even now underway frame courtyards, which are planted with native trees and flowing plants. Balcony corridors cover the surrounding courtyard walls, and there are also roof gardens and terraces. 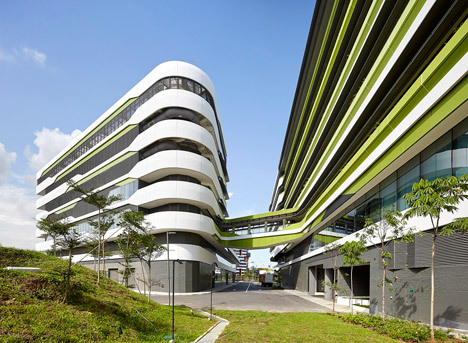 Responding to the tropical climate, the structures include natural ventilation. Sheltered walkways give safe routes across the web site in the course of monsoons, while louvred sunshades across the windows safeguard the interiors from direct sunlight. Photography is by Hufton + Crow apart from exactly where otherwise indicated.